The GeoDome® line draws on our years of experience, combining our proven technologies into streamlined packages. Each system includes an OmniFocus projection system, OpenDome or globe, image generating computer, and software solution. With more than 100 systems in the field, the GeoDome product line makes the benefits of immersion accessible for a broad range of clients. Immersive environments create a unique space for focused, collaborative learning. The GeoDome is an unparalleled tool for systems-based discovery, enabling rapid understanding of complex concepts in STEAM subjects (science, technology, engineering, arts and math). 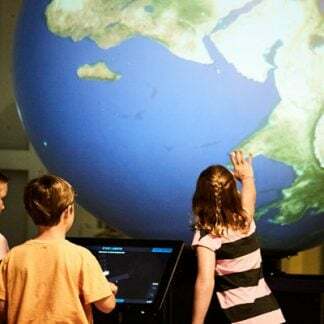 The network of educators using GeoDomes and digital globes includes NASA, NOAA, universities and public schools, and leading science centers around the globe. 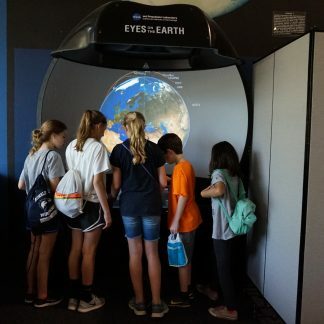 For classrooms exploring their local ecosystem from many perspectives, for planetariums exploring our universe with the latest digital technologies, for museums providing hands-on exploration of science stories – the GeoDome empowers educators as it creates teachable moments and spaces for collaborative dialogue. GeoDomes are a powerful way to capture attention and inspire imagination for our clients in entertainment and experiential marketing. 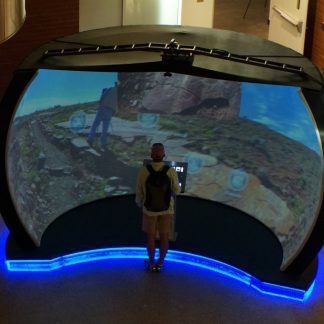 Like head-mounted virtual reality displays, GeoDomes let users explore 360-degree content – but GeoDomes are accessible to all ages and abilities, and allow social, collaborative group experiences HMDs do not. 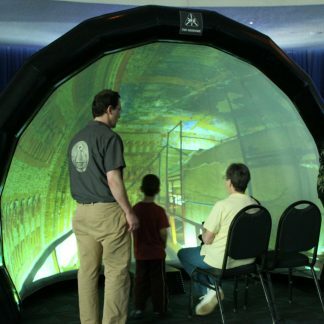 For families experiencing a virtual theme park ride, for VR content development teams previewing the 3D environment they’re building, for marketing agencies showcasing their clients’ global presence – the GeoDome’s “wow” factor creates memorable experiences. The GeoDome Portal incorporates a truncated vertical dome for a casual immersive experience, perfect for visualizing architecture and interior spaces. The GeoDome Panorama’s ultra-wide field of view is ideal for simulations and for exploring places and planetary surfaces. 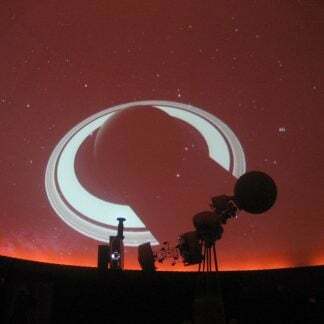 With the GeoDome Evolver package, today’s planetariums can either complement or replace existing opto-mechanical systems. GeoDome Globes drive data-based storytelling with powerful OmniFocus imagery, the most effective way to explore global datasets and immersive VR content on globes. With mirror-based optics, the Cobra is an accessibly priced way to introduce immersion and interactivity.